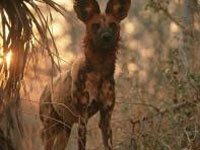 How do African wild dogs live? How many African wild dogs are in a pack? 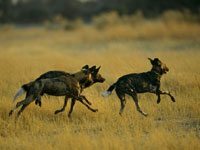 African wild dogs live and hunt in groups called packs. Packs typically include an alpha (dominant) male and female, their offspring and other related members. Historically, more than 100 dogs gathered in packs during spring migrations, but today the average pack of African wild dogs contains approximately 10 members. 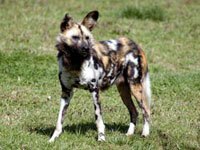 Unlike other canine species, packs of wild dogs frequently contain more male members than female members. 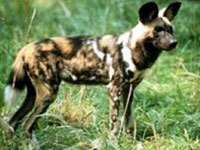 Are all African wild dogs the same? 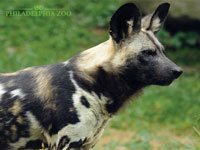 African wild dogs have markings that are unique to each individual, like fingerprints, and help the pack identify each other. The markings may also help the dogs to blend in with the pack, so that prey species cannot determine how many dogs are present. 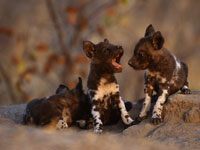 Download free African Wild Dog wallpapers, click on the image to open the large version. Print free African Wild Dog coloring pages, click on the image to open the large version.